The Walking Dead | SciFi Stream - News - Episode Guide - And More! After the war against Negan the communities work to rebuild a better life, forging a new future for their children. But as nature continues to overtake the old world, new dangers threaten the civilization they wish to create. The battle lines are drawn as Rick and the survivors bring all-out-war to Negan's forces. The Saviors are larger, better-equipped, and ruthless -- but Rick and the unified communities are fighting for the promise of a brighter future. A confrontation with the warlord Negan leaves the group changed forever as they struggle under the new reality of his oppressive control. Meanwhile, Morgan and Carol encounter a new group of potential allies: the Kingdom. The group's life in the safe haven of Alexandria faces new challenges, as a super-herd of walkers is discovered nearby and the Wolves turn their gaze to the protected town. But a much more sinister threat lies on the horizon. Rick and his friends must escape the confines of Terminus in order to set out on a mission to Washington, D.C. in what they hope is a chance to set the world right. A growing community and a newfound sense of security make it difficult not to grow complacent, until new threats arrive at the prison gates. Rick and the others arrive at a haven of survivors from the apocalypse, under the dictatorial leadership of a man who goes by the name "the Governor." Rick and the others are forced to regroup after the events at the C.D.C., and seek shelter at a farm. Meanwhile, the search continues for a member of the group lost in the woods. Sheriff Rick Grimes awakens from a coma to find a world overrun by zombies, and goes in search of his wife and son -- and any hope that civilization might go on. 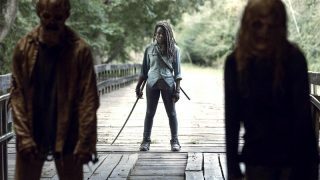 Watch episode previews and more Walking Dead-related videos! Talk about The Walking Dead with thousands of fans now at GateWorld Forum! IN PRODUCTION. Season Ten of The Walking Dead premieres this October on AMC. The studio is planning an expansion of the franchise, including a series of films featuring Andrew Lincoln's Rick Grimes.